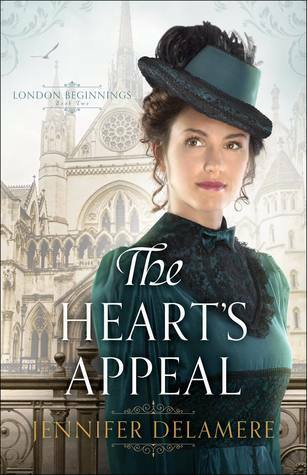 The Heart’s Appeal (2018) by Jennifer Delamere is the second book in her London Beginnings series. This story is available in all forms including eBook, and is 384 pages in length. With a full-time job and a very busy five-year old, this book took me four days to read. I received a review copy of this novel in paperback form from Bethany House Publishers. In no way has this influenced my review. The opinions expressed in this review are my own. I give this book 5 STARS. This story is a Christian Historical Romance set in London, England in 1881. Strong-minded and independent. Julia Bernay has come to London to study medicine and become a doctor — a profession that has only just opened up to women. When she witnesses a serious accident, her quick action saves the life of an ambitious young barrister named Michael Stephenson. It’s only later that she learns he could be instrumental in destroying her dreams for the future. I really enjoyed the first novel in this series, The Captain’s Daughter, and highly recommend it, but The Heart’s Appeal, for me, is the better book. This story has everything — excellently created characters, fantastic historical settings and references, an excellent call to share the Gospel with others, romance, action, and a bit of suspense. I devoured this story, and hated when I had to put it down. Both Julia and Michael have a plan. Julia will scrimp and save, study hard, and get into medical school. She will then become a missionary doctor and go to Africa where she can spread God’s Gospel message, but also heal bodies. Michael is going to become one of the greatest barristers London has ever seen. He is going to marry a lady of excellent standing, and he is going to be wealthy. Both Julia and Michael will see their plans through no matter what! BUT GOD…has other plans. I absolutely loved this set-up because I can totally relate to both Julia and Michael. Man, did I have plans when I was a teenager/young adult. I was going to college no matter what. I was going to get my bachelors, masters, and my teaching credential no matter what. I was going to become a professor of English and teach at a great university no matter what. I imagined, back then, that I would meet the man of my dreams at college, court for a year or two, get married, have four babies, and live happily ever after. I was sure that God wanted all of this for me. BUT GOD…had other plans. Some of my dreams came true. Some of them came true quickly. Some of them came true so late after I had originally made the plans that I was sure God was telling me, “NO!” And many of my dreams never came true. At the time, achieving my goals and losing some of my dreams felt like some of the best and worst times in my life. At some points, I questioned if God even liked me. BUT, as a 38 year old woman looking back, I can only smile. God’s plans for me were/are better than anything I could have ever dreamed, and I can see exactly where God was at every point in my life. The same is true for Julia and Michael in this book. At the end, when they look back at how God worked everything out, they could only smile and thank Him. It’s such a funny human quality that we think we know better than God! What else did I love about this book?! How about everything. LOL! The plot is excellently written. I was SO thoroughly engaged that at one point my daughter was talking to me for about five minutes before I even realized my sweet girl was standing in front of me. One aspect that made the plot so good, to me, were the few medical scenes in this book. They were fascinating! Don’t worry, they are not overly graphic and gross, but they are so educational. It was cool to see what practiced medicine was becoming in 1881. At one point, Julia rushes to a not-so-excellent part of town in London to attend a birth. She is horrified by the dirtiness of the room because of her latest studies in germ theory. Of course, we know much about germs today, but it was a burgeoning field of study in the 1880s. I enjoyed watching Julia’s reaction to this germ-filled environment. I particularly appreciated how she adapted to her surroundings and made the best choices possible even though her surroundings were not the best place to perform medical procedures. There is even more I could say about this book, but I am afraid I would get too excited and spill some beans! Suffice it to say, this book needs to be experienced. I highly, highly recommend The Heart’s Appeal. If you are looking for a fantastic historical fiction to escape into, then I recommend running to your nearest bookstore and purchasing a copy of this book today. It’s SO good!!! The Heart’s Appeal is book 2 in the London Beginnings series. You do not need to read book 1 to understand this book though. You can click HERE to check out my review for the first book in this series, The Captain’s Daughter. I am giving away ONE (1) paperback copy of Heart’s Appeal by Jennifer Delamere. The giveaway begins today, 3-16-18 at 12:00 pm (PST) and ends on Tuesday, 3-20-18 at 12:00 pm (PST). To enter, click on the Rafflecopter link below. Good luck! You are in for a treat. This book is excellent! Jennifer is a new author to me. Her new book sounds great! I have not read any of Jennifer’s books yet, but I certainly love these types of books…the plot, genre, time period and characters. Thank you for this opportunity and for sharing a new author to me. I have read one book by Jennifer Dellamere and loved it. I love your enthusiasm over this new one! I’d love to read it. Thanks for commenting! It was a great book. I tend to get really enthusiastic about the books I enjoy. LOL! I haven’t read any books by Jennifer Delamere. I’m very interested in this one, though. I haven’t read any books by Jennifer Delamere, but I enjoy exploring new authors. This book sounds interesting, and your enthusiasm is contagious! Thank you for the review and the giveaway. I haven’t read any books by Jennifer Delamere. This one sounds interesting, and your excitement is contagious!! I enjoy finding new authors. Thanks for the review and the giveaway.